GRAND JUNCTION, CO USA ― October 2017 ― GPD Global,a manufacturer of high quality precision fluid dispensing systems, conformal coating and component prep systems will exhibit at the upcoming IMAPS 2017. 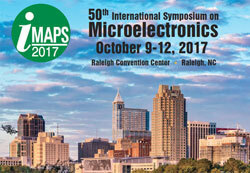 The Expo is scheduled to take place October 10-11 at Raleigh Convention Center in Raleigh, North Carolina. At booth 244, GPD Global will exhibit a complete line of Fluid Dispensing pumps with the latest dispense technologies for integration or retrofit. Whether your process requires low or high viscosity fluids, thick pastes, or abrasive media, there is a dispense pump to meet your requirements. Versatile Precision Auger Pumps are excellent for dispensing pastes down to 150 µm; its carbide wetted parts are great for abrasive fluids. High speed NCM5000 Jetting Pump dispenses small droplets from 2-4 mm above the surface. Volumetric Pump Series (PCD) dispenses low-to-high viscosity greases with outstanding repeatability. Also, ask about our Volumetric 2-Part Mixing Pump that accurately mixes and dispenses two-part components while eliminating entrapped air. Furthermore, GPD Global manufactures a selection of fully automated fluid dispensing systems to meet high production demands and development versatility. Stop by booth 244. Experts are there to discuss your production needs. Whether your project requires a pump for retrofitting an existing dispense system or a fully automated dispensing system, coating or component preparation, we have a solution for you. GPD Global is an equipment manufacturer of high quality, precision, automated fluid dispensing, conformal coating & component-prep systems. The company is an international, state-of-the-art equipment supplier for the PCB assembly and semiconductor industries. We design and manufacture a wide variety of Automatic Fluid Dispensing & Conformal Coating Systems. We also manufacture an SMT Cover Tape Peel Tester and Component Prep equipment for Thru-Hole applications.